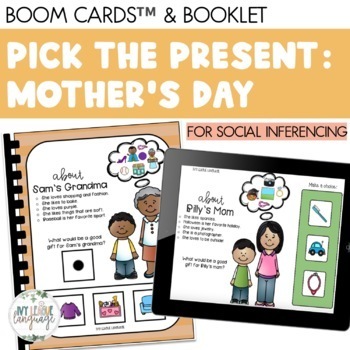 Help your students think about others with this visually supportive activity! Eight pages feature eight different mothers/grandmothers with a 5-point description of their likes, and sometimes dislikes. Thought bubbles above each woman's head provide a visual of the 5-point description. After reading about each woman, students will choose the BEST Mother's Day gift choice from a field of 3 choices at the bottom of each page. Pieces are interactive and engaging to students! Print & laminate book pages (3-13) and trim around edges. Bind with a binding comb. Put rough Velcro on the four blank squares on each page. 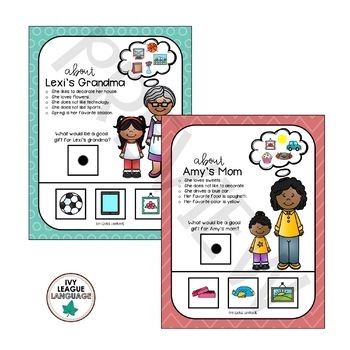 Print & laminate picture choices (p. 14-15) and cut them out. Put soft Velcro on the back of the picture choices. 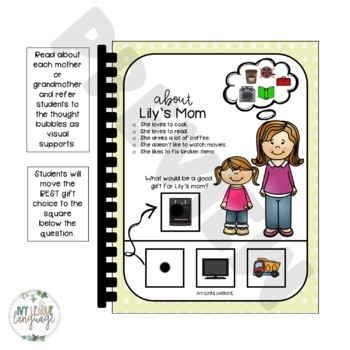 Place/store choices for each child on the bottom of his/her page. Check out the Christmas version of this activity HERE! Check out the Valentine's Day version of this activity HERE! Check out the Birthday version of this activity HERE!